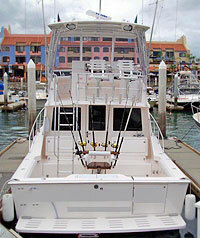 This bad boy is one of the finest sport fishing vessels in Puerto Vallarta. 35 feet of legendary Cabo Yachts quality, fully equipped for the biggest game fish, including marlin, tuna, sailfish, wahoo, and more. If you're looking for a top-quality fishing expedition, you've met your match. We head for the famed fishing grounds of El Morro/Marietas (8 hour trips), Corbetena (10 hour trips) and El Banco (12 hour trips) where the fish of lore are found. See More. This beauty can also be rented for snorkeling trips, sunset cruises, or beach hopping fun days. Snorkeling equipment is included, so get ready for a fun day in the sunshine! Cruise Passengers: Yes! This is a great idea for an excursion. Located very near the cruise ships and adjustable to fit your schedule, very convenient! Includes: 35' Cabo Flybridge Luxury Yacht, All Fishing Equipment, Snorkeling Equipment, Bait, Bottled Water, Ice, English Speaking 2-Man Crew, Fishing License. Up to 6 Passengers if Fishing, Up to 8 Passengers if Cruising.